Mark Chapman, Osi Umenyiora and Jason Bell bring highlights of Thursday night's game between the Miami Dolphins and Baltimore Ravens and preview upcoming games. Welcome to the NFL show. has only tried to do its best. I am sorry, we are sorry. to keep us in check. and that dog for the next half-hour. the Minnesota Vikings in Twickenham. their run to the playoffs. Miami Dolphins and Baltimore Ravens. thumped while in London this year. O God, that was a good one. first win of the season. Both to the Chiefs by the way. It's caught for a touchdown. Really proud of these guys. You can see his right knee. This is a huge loss for the Eagles. Wentz, stays on his feet. and make throws like that? On 1st & goal from inside the five. after him, and they do. How in the world did that happen? 1st down onto the 44-yard line. Inside fake, and another touchdown. this one to Nelson Agholor. who launches into the end zone. What is the pocket, first of all? This is what is known as the pocket. of his mind right now. And look at what this man does. the way down the field. this is, look at him. An incredible play by that man. to get the ball down to. He has nowhere to go. check him out right here. at the other end right here. the receiver down the field. that, so what am I going to do? Don't look here, look right here. Shall we stick with Carson Wentz? is it's changing the locker room. that, as quarterback for the Eagles. man has done so far. second year in the NFL. of the purple heart, right? Curtain up on the big rematch. at the New England Patriots. The Patriots too far ahead. Take that one, stick it in your ear! And the Bills into field goal range. to see the Saints home. into the Chicago Bears' trap. Oh, wrong person, wrong person. I thought you was him. the Browns without a win. A touch of rivalry in the NFC West. The Arizona Cardinals at LA Rams. with Todd Gurley out there. all the way to victory. Matt Moore is on fire. The charge of the Chargers. Good job, guys, good start. By 40 points to ten. record in the AFC North. All to play for in the NFC South. records in the NFC West. Let's take a look at a few of these. this much of an impact. Is that what you put it down to? you've got to kind of learn again. And you can see that timing is off. so much for them under Shanahan. and they have not delivered. He's trying to do the same thing. we were doing this last season? what happens with new offenses. receivers, a great running back. as the season goes along. that's what they do well. squeak by and win some games. we're thinking about the playoffs. going to be in problems. and how they're on this run. defensive backfield, and they have. what they can do offensively. going to be a scary team. Miami had a record of four and two. of points in the entirely. Are we going to do the gap? Even Cleveland have scored more! They brought in Jay Cutler. to the land of milk and honey! Wins here, there and everywhere! We don't know that, Mark! Come on, man, we don't know that. at the M&T Bank Stadium. because of a shoulder injury. Whoa, the ball comes out. Helmet's off, flags are down. there, he leans it down. restraint at the end of that. And I think probably ends the night. Harbaugh knows what just happened. in the eyes of Flacco. Ryan Mallett is his back-up. if you're Baltimore, don't you? it's caught for the touchdown! It's what's on with the reception. It's Watson with the reception. Mallett with the touchdown pass. Second time in Ravens territory. No, it's intercepted by Mosley. Morris is going to try to get him. Trying to get the angle on him. Able to outrace the quarterback. Taking it 63 yards for the score. it's in the end zone. a Raven for a touchdown. the ball at the two. Fortunate for Baltimore to recover. Pass away and it's picked. Look out, here they go. it to the end zone. There's a cat on the field, Jim! you ran in high school. Look at the change of direction. A couple of divisional ones. I've got to talk about that. Well, you have, that's your job. I can't leave you hanging like that. the hard ones, all right. It's, you know, a divisional game. the home team on this one. the Dallas Cowboys on this one. Dallas and Washington are 3-3? could they be out of it? many strong teams in the NFC. if they win a couple more games. so it does make it difficult. from this list of fixtures. a point in a game since 1992? because they lost the last couple? to be playing the Denver Broncos. and a tremendous amount of pride. at it in the locker room? a point on the board. So, to get beaten like that, no. to the Vikings and the Browns. is a real mess, isn't it? Yeah, it's a real mess. to play quarterback over there. so you on that short leash, right? I know you like leashes, by the way! Let's not go there again! in the last two games. you start him the next game? be all over the place. no clue what he's doing. and then bench him again. with some of Jason's "friends"
who arrived in London on Friday. and you guys playing games out here? obviously a desire in this market. with injury to a guy like that? to see a guy go down. the Bears have won two in a row. We don't expect that to change. year, is going to be in Minnesota. to play in their home stadium? Yeah, we want to be the first. you shouldn't be out here. never be able to make up. So that's why we do this. many good football teams in the NFC. they are one of them? No question about that, man. make some noise in NFC. playing as well as he is? they aren't asking him to win games. to turn the ball over. of the game, you can win. have to win you games. I'm reading different things to you. and a good running game. to the Super Bowl than most teams. Plenty of highs and lows this week. and that stiff arm there. did they, the Falcons, really. This is amazing from Kenny Stills. and how much of it is luck. That makes you sick as a DB. I would have got fired! They would have blamed that on me. thrown out of the club. a real mess of this. who was able to pick it up. He had two big plays that game too. on the day for Chicago. They're going to love him tonight. Have you seen his daddy catch, man? It's skill, give it to him. a touchdown for the Jets. Playing hide and seek, the Steelers. are on their way to London. 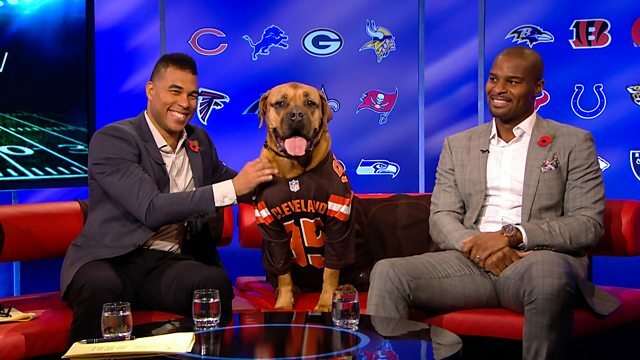 Scandi canine, only in the NFL! Mark Chapman, Osi Umenyiora and Jason Bell bring highlights of Thursday night's game between the Miami Dolphins and Baltimore Ravens, as well as all the big news and a look ahead to week eight's remaining fixtures.